I write this letter as a blessed cease fire is just going into effect, — not the first cease fire, and I don’t know if this one will hold. But it may be, so we all hope, that the Gaza war is over. If not now, then very soon negotiations for a lasting cease fire or even for something that might look like peace will begin. 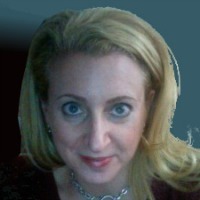 I have no sense of how these negotiations will go, but all of us at Americans for Peace Now believe that this is an opportunity for Israel to act boldly to strengthen the Palestine Authority (PA) and its new unity government and, with its help, to prevent or strongly curtail the rearmament of Hamas and to open the way for reconstruction and economic development in Gaza. But Gaza is not alone. There can’t be a legitimate PA in Gaza unless Israel is ready to work with the PA in Ramallah for the two-state solution that we have been defending for so long. When you read this, you will know whether Israel and Palestine have moved closer, or farther away, from this necessary goal. Meanwhile, we have to think about what is happening inside Israel itself. Before the war began, we followed with horror the news of the kidnapping and murder of three Israeli boys and then of the murder of a Palestinian boy. Gilad Shaer, Naftali Fraenkel, Eyal Yifrah, and Muhammad Hussein Abu Khdeir: in our hearts, these are all “our boys,” who died deaths that no child should. Last semester, Ori Nir, APN’s Director of Communications and Public Engagement, came to American University to speak, and it was a jam-packed event. Some students came for the free pizza, but everyone stayed for Ori’s intelligent, open, and engaging conversation on the Israel-Palestinian conflict. That was when I knew I had to intern for APN. Interning this summer with APN has given me invaluable tools to continue being a leader on campus and in general, and has taught me how to effectively do my part to work for peace. It is imperative that APN is able to continue their powerful campus outreach and internship programs. 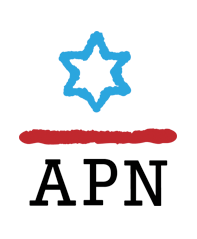 Please support APN’s efforts to empower the next leaders of the Jewish community and the country. I hope to raise $5,000 to help APN do this. At this time of chaos and violence, it is especially important that APN has the resources it needs to continue reaching out to young students and leaders who envision a brighter future. With APN’s help, we will work to make that future a reality. I would like to bring your attention to an article featuring APN’s summer intern Hamze Awawdeh, a young Palestinian from Dura, just outside of Hebron which ran in The Forward and was picked up by Ha’aretz. Hamze is spending the summer with us as a part of our Joint Internship program with the American Task Force on Palestine (ATFP) . 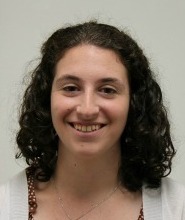 While we host a Palestinian intern, ATFP hosts an Israeli intern. For the past five years, through this program, Israeli and Palestinian students have worked jointly and forged close personal relationships. Growing up, Passover was my favorite holiday. I loved the Passover story about the Jews being saved from the evil Pharaoh in Egypt. I loved the miracle of the parting of the sea and survival crossing the desert (as a kid raised in the Arizona desert, I felt a special kinship with those early Israelites). I loved the Seder — especially the part where we dipped our fingers in the wine as we enumerated each plague. And I of course loved the food, particularly my mother’s matzo balls (sinkers, not floaters) and the red horseradish that always made me sniffle and sneeze — and which, invariably, somebody spilled on the tablecloth to leave a permanent beet juice stain. Our Jewish tradition assigns meaning to many milestones in life. At 12 or 13 we have a bat/bar mitzvah. At 15, it’s time to start studying Talmud. Forty is when you can study kabbalah. But when you turn 95? Bupkas. Judaism has nothing to say. Participants viewed Israeli military installations and Palestinian villages that are routinely vandalized by extremist settlers. Tour participants paid a solidarity visit to one of the Palestinian villages that has been a target of choice for the violent settlers, the village of Kusra near Nablus, where residents received them with flowers. Peace Now has been taking Israelis to the West Bank for years to show them up close what the occupation is doing to Palestinians and to their own society. 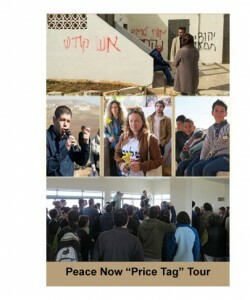 Recently, because of the uptick in settler violence and because of the re-energized peace talks, Peace Now decided to boost this program by adding topical tours. Last week it was a tour to explore the “Price Tag” phenomenon. In the coming weeks Peace Now is planning tours to other trouble spots, featuring other maladies of the occupation. These tours are expensive, but critically important. Please support this program. You can help Peace Now expose the occupation to Israelis. 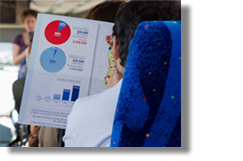 A contribution of $50 will sponsor two seats on the bus. For $100 you can send four Israelis for a day in the West Bank, and open their eyes to what their government does there in their name, and to what the settlers are doing to the Palestinians and to the future of the state of Israel. Join us now. Tu Bishvat: We are planting for the future. The stakes are high. While many persist in comparing the Israeli-Palestinian conflict to a schoolyard brawl, Israelis and Palestinians are struggling with matters of life and death. The question of the possibility of peace holds existential ramifications. No, not again: Peace Now still. Indeed, in words we rarely allow ourselves to use, Peace Now, now more than ever. Winter approaches, and the days grow shorter. The world becomes darker and feels colder. This year, Chanukah comes at a time when we can still see some daylight when we light the candles, underscoring the gift of light, the miracle of Chanukah.